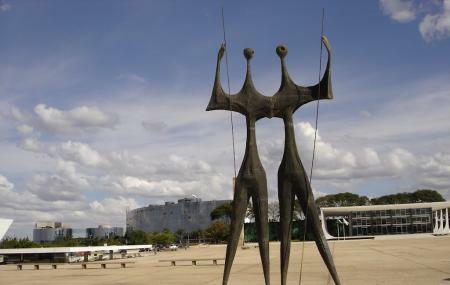 The Praça dos Três Poderes is a famous plaza in Brasilia. The name is derived from the fact that this civic space integrates the headquarters of the three branches of government: legislative, executive and judicial- the National Congress, the Presidential Office and the Supreme Court. The plaza was designed by Oscar Niemeyer and Lúcio Costa. You will find a couple of interesting sculptures at the plaza as well along with the world’s largest flag. Praca Dos Tres Poderes Address: Brasilia, Brazil. How popular is Praca Dos Tres Poderes? People normally club together Banco Do Brasil Cultural Centre and Mane Garrincha Stadium while planning their visit to Praca Dos Tres Poderes. The plaza in between the presidential office, the supreme court, and the congress building. The Hall of Heroes, Brasilia history building, and the underground hall with the model of the city were also worth a visit. It was interesting to see the buildings and museum, but would have loved to learn more. An iconical landmark for archtecture lovers and modern archtecture. Straight and clean concrete lines hanging glasses bringing a sense of solitude.